Seemingly overnight there is now competition in the MP3 Springboard market. 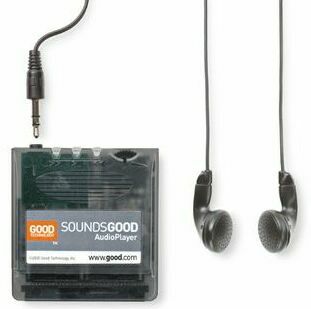 Now we have the SoundsGood MP3 player from Good Technology. This standard-size Springboard module has shaped up to be -- pretty good! The SoundsGood is a standard-size module, sticking out less than two millimeters above the Visor. Even though it's standard-size, the SoundsGood still has hardware buttons that let the user change tracks while in another application and a wheel to adjust the volume. A headphone jack completes the external hardware on the SoundsGood. Earbud headphones and a carrying case are also included. Five Point Plan - "Live Today"
The Color Red - "Smile"
Good Technology - "Welcome to SoundsGood"
The Salt Brothers - "Captain Morgan"
The Salt Brothers - "Go Ahead"
Randi Driscoll - "What She Said"
Soul Cracker - "Too Far Too Hard"
Gregory Page - "The Banks of the Ponch"
Run Good Desktop on the PC. Put the Visor in its cradle and either run the Connect application or tap Connect from within AudioPlayer. Drag-and-drop files from the listing or an Explorer window to the main Good Desktop window. Click MediaSync Now to begin transferring files to the SoundsGood. In my testing, it took a mere 17 seconds to transfer a 4040 KB file, for a whopping transfer speed of 13.9 MB/min when using the Good Desktop to transfer songs to the SoundsGood under Windows 98. This is a fantastic speed -- Good Technology hired someone who's very well respected in the Unix world to write the USB driver, and it shows. » Size: 2.13" x 2.22" x .35"